Defending champion Fribourg Olympic (SBL) strengthened their roster with addition of 20-year old forward Brandon Kuba (198-98). 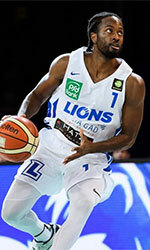 He already started the season at Geneve Lions (SBL). But in four games he did not score anything and had only 1 rebound and 1 block. The last season Kuba played also at Geneve Lions where in 12 SBL games he recorded just 0.4ppg. He helped them to win the Supercup and make to league final. Kuba has played previously for three other teams: Monthey, Bernex and Lions de Geneve Releve U23.